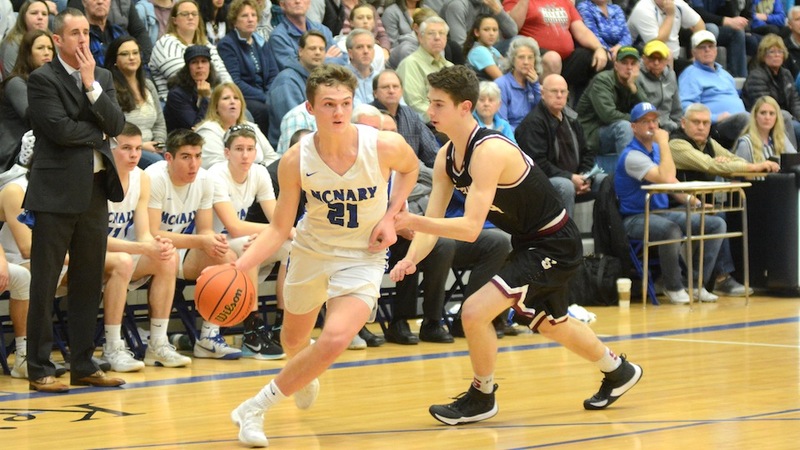 McNary cruised into the second round of the 6A boys basketball state playoffs with a 71-46 win over Sherwood on Wednesday, Feb. 28. Sherwood, the No. 28 seed in the state tournament, battled No. 5 McNary early but Riccardo Gardelli and Chandler Cavell made back-to-back 3-pointers at the end of the first half and the Celtics went into intermission with a 27-17 lead. McNary outscored the Bowmen 18-10 in the third quarter to take command of the game and lead 45-27 entering the fourth. Cavell led the Celtics with 24 points, including 13 in the first half. Gardelli scored 16 points, making four three-pointers, and Garvey added 13 points in the rout. Sherwood shot 9-for-14 from the free throw line in the second half and made 13 field goals. McNary junior Boston Smith missed the game with mononucleosis. Junior Walling started in his place. The Celtics will host No. 12 Tualatin Saturday at 7 p.m. in the second round of the playoffs with the winner advancing to the quarterfinals at the Chiles Center in Portland. Tualatin plays in the Three Rivers League with Sherwood and lost to the Bowmen 53-45 on Jan. 26 before getting revenge with a 63-58 victory on Feb. 22 to close out the regular season. McNary and Tualatin already met earlier this season with the Celtics winning 72-58 on Dec. 27. “I don’t want to get a false sense of confidence because a lot of times this year we’ve played teams the second time around that we beat by a lot and it’s been a lot closer so we’ve just got to come ready to play,” Cavell said.